We’re hurtling towards a conclusion of 2016’s Most-Wanted Omnibuses from TigerEyes’ secret ballot, but before I could even get the whole list out some of them have been announced for publication in 2017! This isn’t all that unusual – they whole reason TigerEyes runs this survey in May and June of each year is to beat the solicitations for January of the following year. Anticipating we’d see a few of the most-wanted books picked off, he reveal a list of the next six books that just missed the cut. Possible Contents: 2001: A Space Odyssey Treasury Edition (1976) and 2001: A Space Odyssey (1976) #1-10 – plus Machine Man #1-19. There’s also a 1984 Machine Man 4-issue limited series sometimes referred to as Machine Man 2020. What is it? 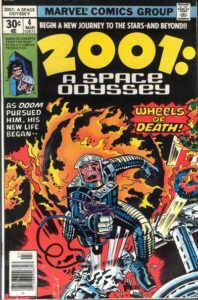 Marvel’s 2001: A Space Odyssey started out as a direct adaptation of the Kubrick film (with aspects of the Arthur C. Clarke novel) by Jack Kirby. Kirby continued developing original concepts from there in a subsequent 1o-issue series, which in turn spawned Machine Man – a comic (and character) firmly rooted in the Marvel Universe. Want to read it right now? The 2001 material is stuck in licensing limbo, but Marvel is reprinting the entirety of the Kirby & Ditko run on Machine Man in just a few months in a trade paperback! Possible Contents: Amazing Spider-Man #30-58 & 500-508, with a following volume to collect #509-545 and tie-ins from Friendly Neighborhood Spider-Man (2005) #1-4 & 24, Marvel Knights Spider-Man (2004) #19-22, The Sensational Spider-Man (2006) #41, and Spider-Man: The Other (2005) Sketchbook and Spider-Man: One More Day Sketchbook (2007). What is it? Spider-Man’s main title kicks back into high-gear under the pen of TV writer J. Michael Straczynski with some big, bombastic stories and a few crazy concepts (Spider Totems! ), but the run ends in a flaming wreck with the most-despised Marvel story of all time – One More Day. Want to read it right now? 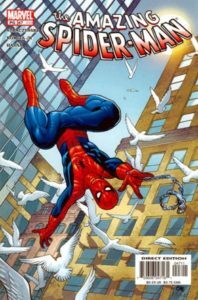 This run was original released as trade paperbacks and then re-issued in a convenient five book Ultimate Collection series, as detailed by the Spider-Man Guide. A few of the Ultimate Collections are getting a little hard to find, but with persistence you can pick them up affordably. Probable Contents: A pair of prior TPBs collected Avengers #345-347, Avengers West Coast (1989) #80-82, Captain America (1968) #398-401, Iron Man (1968) #278-279, Quasar (1989) #32-36, Thor (1966) #445-446, and Wonder Man (1991) #7-9, plus a story from What If…? (1989) #55-56. An omnibus should also collect an the epilogue in Wonder Man #10 (since it includes similar aftermath from Quasar #35-36 and Captain America #401). Possible Contents: Now that Marvel is in the habit of using event omnibus to extend to cover adjacent runs (see Avengers: The Crossing and Infinity Gauntlet), it would make sense for this to push through some further cosmic stories until Avengers #351, or even all the way to #367. Similarly, many of these series will be hit shortly after by Infinity War, and for the rarely-reprinted Wonder Man and Quasar it would be arbitrary to cover them up until that point. For Wonder Man that would be #11-12, though it could easily also include Wonder Man #1-6, which might never otherwise see print. For Quasar, it could pick up from Infinity Gauntlet with #28-31 and then the trailing Quasar #37. What is it? Avengers unite for their first multi-title crossover to intercede in the battle between two of Marvel’s three inter-galactic heavy-hitters, the Kree and Shi’ar. That lead to a major development in Marvel’s space civilizations. In addition to being a superhero Star Wars, this also played out long-building tensions between Captain America and Iron Man. This was an especially well-coordinated crossover that hit a lot of character beats in the midst of its space opera. Want to read it right now? You can still chase down that older pair of TPBs – Volume 1 and Volume 2 – though I believe they have a handful of printing errors. 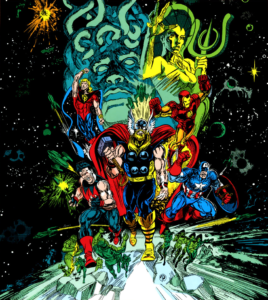 With all the surrounding series hitting Epic collection at some point, I really wonder how this will be handled, but with the Avengers-in-Space theme I think this might as well wait until the Infinity War movie hits for maximum tie-in potential. Probably Contents: The first Doctor Strange omnibus out later this year is a major rule-break – it’s not even two Masterworks long! That opens the door for this one to complete MMW Vol. 2 and then capture through the end of MMW 5 – Strange Tales #147-168, Doctor Strange #169-183, The Avengers #61, Sub-Mariner #22, Incredible Hulk #126, Marvel Feature #1, Marvel Premiere #3-14, and Doctor Strange #1-9. Possible Contents: That’s sounds like a lot of content already, but Strange Tales was a split title with Strange only in half of each issue. Adding all of those Masterworks together, we’re still easily under 900 pages. Could we dare to include one more Masterwork to get us Doctor Strange #10-22, Annual #1 and Tomb of Dracula #44? Admittedly, that’s an altogether massive classic Omnibus, but the Roger Stern Strange omnibus demanded from the survey would pick up neatly from that point. What is it? This is the Doctor’s more philosophic period, with Gene Colan toning down some of Ditko’s more psychedelic dimensions and before Roger Stern turned him into more of an action hero. 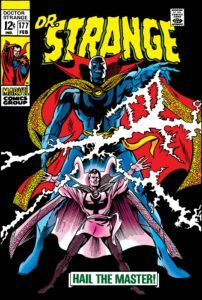 This run includes the formation of The Defenders and Doctor Strange assuming the mantle of Sorcerer Supreme! Want to read it right now? Doctor Strange’s Marvel Masterworks are getting harder and harder to track down as his movie approaches, so if you don’t want to wait for an Omnibus you might want to get started now. See the Doctor Strange Guide for more info. Possible Contents: The Micronauts (1979) #1-44 & Annuals 1-2, plus bonus materials from reprint series The Micronauts: Special Edition (1983) #1-5. Then, a second volume would include Micronauts #45-59, The X-Men and the Micronauts (1984) #1-4 (after 57), and Micronauts: The New Voyages (1984) #1-20. What is it? 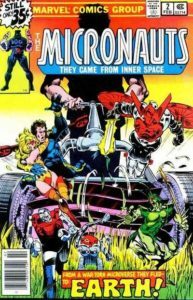 Like ROM, Micronauts is another of Marvel’s dice-rolls on licensing a toy line where the toys fizzled and the comic exploded. The toys were like a proto-Transformer heavily influenced by Japanese robot fighting toys Microman. As the story goes, when Bill Mantlo saw his son play with them his imagine went into overdrive and he convinced Marvel to purchase the rights. He would write the vast majority of their Marvel material, which placed the team in Marvel’s microverse – an infinite sub-Universe lying beneath our own at the sub-molecular level. Want to read it right now? You need to track down single issues, unless IDW’s new Micronauts license includes the rights to reprint the old Marvel material – which, like ROM, is made tricky by the fact that Marvel included elements of their own universe in this book. For example, they fought villains including Molecule Man and Fixer, teamed with Man-Thing and S.H.E.I.L.D., and the Micronaut Bug later became a Guardian of the Galaxy! Possible Contents: X-Men Legacy #208-234, 238-244, 248-260, & Annual 1, plus Original Sin crossover material from X-Men Original Sin & Wolverine: Origins #28-30. What is it? 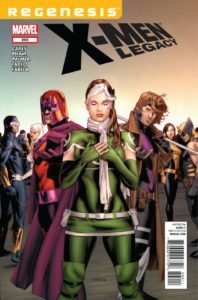 X-Men with intense focus – author Mike Carey treats the book like an Xavier solo series before shifting his attention to Rogue. Mike Carey writes the best Rogue since Claremont, getting her powers under control in a way that doesn’t detract from her as a character and then building her confidence while never losing her impetuous nature. Even as a team expands around her as a capable leader after Second Coming, all of the major character development is focused solely on Rogue as a leader and strategist. This 52-issue book would big amongst Marvel’s biggest Omnibus volumes. 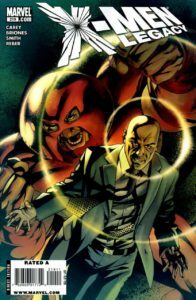 It starts from the end of Messiah Complex, includes issues from Utopia and X-Necrosha (neither were direct crossovers to other titles), and then skips Second Coming (in #235-237) and Age of X (in #245-247) – both of which are in their own oversize hardcovers. You could make the argument to include #200-204, since it sets up Rogue’s condition, is also by Carey, and plugs the brief OHC gap that follows Supernovas and proceeds Messiah Complex. Since those issues all had Endangered Species backups they are shorter than normal you could maybe squeeze them into this omnibus, but we’re getting into some absurdity at that point. Really, the Age of X material is pretty heavily connected to everyone’s character development (including Rogue’s), but it introduces a further five issues with New Mutants (2009) #22-24 and Age of X Universe #1-2, plus online material from Age of X: Historical Logs. X-Men by Mike Carey, Vol. 1 – 42 issues. X-Men (1991) #188-204 & Annual, X-Men Legacy #208-227, plus Original Sin crossover material from X-Men Original Sin & Wolverine: Origins #28-30. This ends with Rogue in control of her powers and rejoining the main group of X-Men in San Francisco. X-Men by Mike Carey, Vol. 2 – 37 issues. X-Men Legacy #228-234 & 238-260 and Annual, Age of X crossover material from New Mutants (2009) #22-24 and Age of X Universe #1-2, plus online material from Age of X: Historical Logs. Want to read it right now? This run is entirely covered by initial release hardcovers and paperbacks. See the X-Men: Legacy Guide for all the details (and the second half of the X-Men, Vol. 2 guide for Carey’s preceding run). Marvel’s Most-Wanted Omnibuses – What’s been printed and what’s gone missing?